We at ShowerMan are all about Customer Service. The customers are what makes this company, and Customer Service is our Warranty! 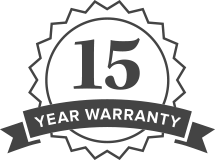 Why a 15 Year Warranty? 15 years was chosen to give you the confidence that we'll be with you and stand behind our product and installation. We are all about the customer and any products ShowerMan recommends are the best available because we only work with the best. We at ShowerMan are so confident in our product and installation that we can guarantee our Frameless Glass Enclosures for 15 years. Because our Warranty lasts so long, and covers so many different aspects of your Frameless Shower Enclosure, we have the Warranty online so you, the customer, know exactly what is covered. Frameless Shower Enclosures are warrantied for a period of 15 years. Tempered glass is covered for breakage. Because shower doors hang off fixed panels, some customers may experience a small amount of flex in their glass. This is a natural occurrence in totally frameless enclosures because there is no frame, which is why we use such thick glass. Did you ever notice on an ice rink the glass surrounding the rink shakes when bumped or hit by hockey players? Having a slight flex is normal and also a good thing. If your glass didn't move or have slight flex, there would be excessive stress on the glass at all times. For the first year after installation, there are no charges for service calls in regards to vinyl and plastic or minor adjustments. After one year, a $125 service charge will go into effect on replacement of any parts and service calls. Of course, all parts are at no charge. Hardware is covered for the finish and performance. However, brass finish hardware is not covered under warranty as minerals in the water of different townships will cause discoloration to brass finish hardware. Harsh and abrasive cleaners may not be used on the hardware and will void the warranty. Please read our Maintenance Page so that you will be able to stay within the parameters of the warranty. Caulking and silicones used to seal glass to the tile are warrantied for the purpose of creating a seal. Although easy to maintain, our Frameless Glass Enclosures are not maintenance free. Mold is a maintenance issue and not a Frameless Shower Door issue. Frameless Shower Enclosures have less of a chance of developing mold, but mold and bacteria are a maintenance issue on the part of the homeowner and are not covered under the warranty. Harsh and abrasive cleaners, as well as anything with grit, can scratch the glass. Please read our Maintenance Page so that you will be able to stay within the parameters of the warranty. During or after the installation of your Frameless Shower Enclosure, very rarely a breaking of tile has happened. Almost always, this is due to faulty installation of the tiles, when the tile installer left a hollow behind the tiles. If this is the case, we recommend you call your tile installer. ShowerMan will remove the glass enclosure from the wall for a service charge to the customer to make it easier for the tile installer to complete his repair. Unfortunately, some contractors don’t install tiles properly. In these instances, water can get through the grout and tiles can come loose or completely fall off. If the customer decides to have ShowerMan’s glass enclosure removed because of tile malfunctioning or improper installation of tiles, there will be a charge for ShowerMan to come and remove the glass enclosure, which will be determined at the time of the work order. Glass tiles are not the preferred tile in the shower area because tiles must be drilled to support the Frameless Shower Enclosure. Glass tiles can crack or chip during the installation, but also during and after regular use of opening and closing the shower door. Because glass tiles are fragile, there is the potential for breakage even after initial drilling was successful. Again, ShowerMan will remove the glass shower enclosure for a service charge to the customer so that new tiles can be installed. Upon removal of old shower doors, tile or marble may be stained under the tracks of old shower doors. ShowerMan is not responsible for tiles or marble stained by previous shower doors. Also, at times during the removal of old shower doors, tiles may become loose or cracked. These must be fixed by others. Because Frameless Shower Enclosures have no frame, at times there may be some slight seepage. More often then not, if there is significant seepage, it is due to the improper installation of the curb or sill (the step into the shower) by the tile or granite installer. If the curb or sill is pitched in the wrong direction (in other words, pitched towards outside the shower and not towards the inside of the shower), the water will run onto the floor. During the design process, the designer will use a level on your curb or sill. If the designer finds that it is sloped or pitched in the wrong direction, the designer will notify you at that time. ShowerMan is not responsible for the improper installation of the curb or sill, or for the leakage that may be a result from improper installation. The use of body sprays or handheld showerheads sprayed directly onto the glass shower enclosure may lead to some seepage because seals and crevices were not meant for such high pressures. The customer is responsible to register their warranty by clicking on the button below. Even still, the customer must retain the proof of purchase. If the customer has purchased Guardian’s ShowerGuard Protective Coating, the warranty is provided directly from Guardian and not ShowerMan.